Good weather means more outdoor activities for us to enjoy, but it also means we as responsible pet parents need to remember our pets can be severely affected by the sun, humidity and higher temperatures. One of the most common causes of dogs overheating is being left in hot cars. Did you know that according to the K9 Rescue even if it’s only 75 degrees outside, the inside of a vehicle can heat up to 100 degrees in only 10 minutes? And the higher the temperature is outside, the faster your car will become a suffocating tomb to a trapped pet. Let’s explore the signs of heat exhaustion in our animals and what we can do to avoid this growing problem. 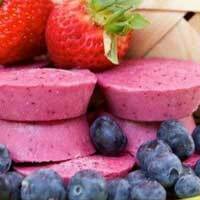 Also, find 3 refreshing, frozen pet treat recipes at the end. If your pet is left unaided, heat exhaustion could turn into more serious conditions like coma, seizures and even death. In addition, if you have a Brachycephalic breed (pushed in nose) such as a Pug or Persian cat, these animals tend to have a harder time cooling down due to their restricted airways. Older animals, those with heart or lung problems and heavy-coated pets also need to be watched closely on extremely hot days. Get the animal to a shaded or cool area. Offer cool water to rehydrate. NEVER use ice cold water as this can constrict blood vessels and actually impede the cooling process. NEVER force an animal to drink. Use cool wet clothes around the head and paws. Let your pet lick ice cubes. Even if your pet comes around after exhibiting these symptoms, you will still need to get to a veterinarian ASAP as the internal organs and brain can all be affected by the elevated internal temperature accompanying heatstroke. While at the vets office he or she will also check for a potentially fatal condition called Disseminated Intravascular Coagulation which can occur after heatstroke – this is when thicken blood or blood clots become overactive in the animal’s body and can cut off circulation to the major organs and even the brain. 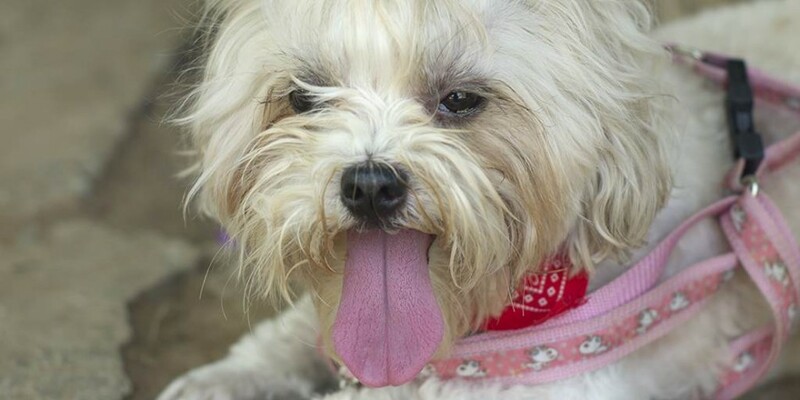 Keeping your pet comfortable on hot summer days is the best way to avoid the nasty results of heatstroke. Leave Fido at home even if you are only running into the store for a short period of time. Also, keep the temperature of your home cool by closing the curtains or shades during the hottest part of the day. Be sure to always have fresh cool water available for your pet and avoid strenuous activities during the hottest hours (noon till four). Most pet retailers also sell a unique “Cooling Mat” that uses pressure technology to cool the mat down. No refrigeration or electricity required. And there’s always filling up a small children’s pool to let your pet play in the water and cool off. My pets love frozen treats, even my twin cats. Here are some easy recipes that will help keep your pets cool. My dog, Max, loves this creamy recipe. 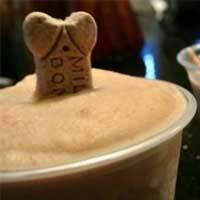 Blend all ingredients together, pour into plastic cups, top with a milk bone and freeze. I love this colorful treat and so does Max. 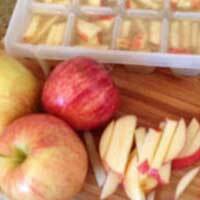 Blend all ingredients until smooth, pour into an ice cube tray or plastic cups and freeze. This non-dairy treat is also super easy to make and fast to make. Best of all, it’s very popular with dogs. Mix the broth with the chopped apples, pour in an ice tray and freeze.